Summer is almost over and the love of my summers is going to go out from markets soon. Until then we are going to honour the king of fruits - Mango. For us, in the tropics, summer isn't all about the Sun, we see the Sun all year round. But summer brings with it the delicious juicy selection of seasonal fruits like the mango, jackfruit, guavas and melons. But for us Indians, the Mango rules the heart. Lalbagh in Bangalore has been hosting the annual Mango festival from 27th May. It is scheduled to be around for a month. So if you have not yet made the trip, you should. They have a wide variety at very competitive prices. We went there 2 weeks ago and bought several kilograms of Alphonso, Kalapad and the tiny Sugar Baby or Sakre Gutti. I bought the Sugar Baby mangoes only to make this sweet and sour ripe mango curry. You heard it right, ripe mango not raw. I've eaten it before, but never made it myself. So the recipe is new to me too. I called up several people and collected 5 different recipes, before I decided to make this one given to me by my very close friend Anju from Goa. 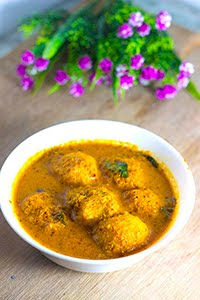 It is a delectable curry made with coconut, mangoes, and mustard. Tastes best with rice, but can be enjoyed with bread as well. The following recipe serves 3. Mango curry made with ripe mangoes and fresh coconut. Dry roast 1/2 tsp of the mustard seeds in a pan on low heat for 1 min. Be careful not to burn it otherwise the curry will turn bitter. Heat 1 tsp of the oil in the pan, add the red chillies and fry for 30 sec or until the chillies are crisp. Grind the coconut, roasted mustard seeds and red chillies into a coarse paste with a little water. Add the coconut paste, turmeric and asafoetida and fry on low flame for 2-3 mins. Add water to achieve the desired consistency. Add more if eating with rice and less if with bread. Add salt and jaggery. Do not add all the jaggery at once, taste and add. If the mangoes are very sweet, you may not need much. Squeeze the tamarind in the water and remove the pulp. Add this sour liquid to the curry. Again, like the jaggery, do not add all the liquid at once, taste and add. If the mangoes are very sour, you may not need it. Cook on low heat for 5 mins.